This section includes useful information about how can people use Find Protected for various purposes. You will find the description of basic features and popular solutions. 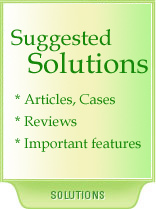 New articles: read about security problems related to recent files. Recent files, also referred to as temporary files, are those created automatically and stored on the system's hard drive. Potential danger. The thing is that the recent files make your privacy and your company's confidential information vulnerable. More about recent files danger. Recent files information leakage. Many applications require to create and maintain temporary files. Read about risk of information leakage associated with recent files. Security Scanning. Computer forensics companies use Show Hidden Files to support security scanning process. Protecting data against insider abuse should be an important consideration for corporate security strategies. More in Insider threat to corporate information security article. Specific security measures allow the users to prevent this kind of information leakage. More in Google Hacking and Confidential Files Protection article. Documents are the most valuable information asset within a company. That is why it is essential to provide its security within an enterprise and after it leaves the corporate network. More in Document security within an enterprise article. Information technology has become performance multiplier for almost every organization. However, it is associated with numerous vulnerabilities that may cause serious damage to business reputation and result in revenues reduction. More in Information security management article. In the new world of technology, it is vital for the business management to actively and aggressively respond to major security challenges. The management has to work out common standards of information security risk assessment and mitigation. More in Security management article. Police investigative software. Show Hidden Files is an utility that allows police officer to find password protected files and secure storages on local hard disks and across the network. Find Protected is a good police investigative software that helps police officers doing their job when researching suspected's computer. If you are looking for solution for your very needs, then feel free to contact us with your query. We'd be happy to answer you and help to optimize your routine job with one of our programs. We'd be happy to recommend you one of existent solutions that fits you very needs. We will provide you with URL link to the appropriate article on our web-site. Once you need some solution based on Show Hidden Files, then probably someone else is looking for the same thing. We are interest in providing our users with useful information about usage of Show Hidden Files and will be happy to write about new application or add some new features to Show Hidden Files. Please, let us know what is you job and what process you think you can improve with Show Hidden Files. Let us know more about your industry and it's problems, so we can understand your needs.